Don’t miss out on this fun-filled evening! Plan to bring your family, friends, and neighbors to the 2019 Spring Auction! $75 per person includes food, entertainment, live and silent auctions! 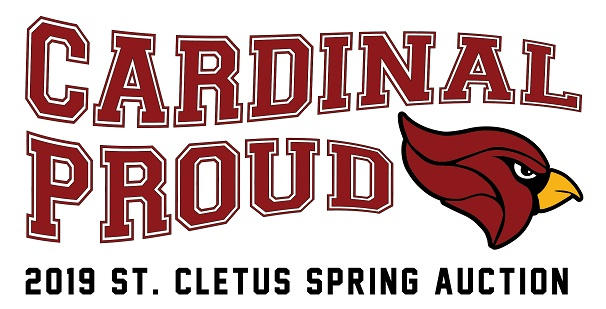 Join us in your St. Cletus spirit wear or casual dress attire and help us reach our goal of $80,000 that directly goes toward the operating budget of our school. Enjoy the food made by Capri, a nacho bar, and late night pizza. The Call for Cash this year will go toward our new math series. It costs approximately $2,500 per grade level for our math curriculum. Please help us reach that goal to cover all of our grade levels! There will be many silent raffle items and some fabulous live auction items, as well as basket raffles. Come relax, eat, drink, play in the bags tournament, and dance. Meet some new people or stop and say hello to Principal Tom Chinske or Assistant Principal Christy Schaefer! It’s Always a Great Day to be a Cardinal! Please consider sponsoring this wonderful event. Through sponsorship and donation of items, your company will gain exposure to families and community members not only who attend the event, but also leading up to the event through online and print communication. Your support of the Auction helps ensure our children excel spiritually, academically and socially. Our fundraising events hope to be tremendously successful – thanks in large part to supporters like you. Thank you in advance for your generous support of St. Cletus School. If you have any questions about the Auction or sponsorship opportunities, please don’t hesitate to email us at auction@stcletusparish.com.